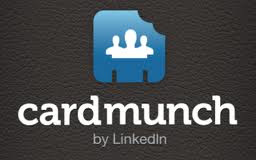 THE MARTINI CHRONICLES: About CardMunch...by LinkedIn! Picture it...you're at a networking event or a conference (or some other place where business cards are being exchanged). You have had a series of scintillating conversations with potential clients and/or business acquaintances. You manage to score several business cards, and you vow to follow up with these individuals for various reasons in the near future. A week has passed, and you remember that you need to reach out to these individuals, but you are foggy as to why you initially wanted to keep in touch. You may have even lost some business cards over the past week. Does this story sound familiar to any of you? I can't tell you how many times I have been at a networking event or a conference, and have forgotten the reasons I requested an individual's business card. I have also lost plenty of them along the way, which is clearly unfortunate and careless on my part. But like many other obstacles that face business professionals across the globe, there is an app that I believe will alleviate business card regrets. 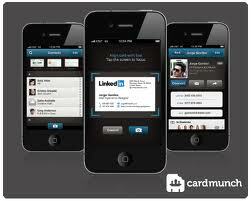 CardMunch is an free app from LinkedIn. CardMunch allows you to take a picture of a business card, upload it, and send it to the fine folks over at the CardMunch factory to transcribe the information from the card. Several minutes later, your contact's information appears in your CardMunch contact list. Done and done! In addition to eliminating a plethora of business card regret, CardMunch also has additional features that have proven to be ridiculously convenient. For example, once you have taken a picture of the business card, you have the option of inputting notes to accompany the card. This is especially helpful if you are the type of professional who writes down reminders about a contact on the back of his or her card when you receive it. CardMunch also allows you to instantly invite a contact to connect with you on LinkedIn (if the individual is not already a connection). You also have the option of storing your new contacts on the CardMunch contact list, or you could store the new contact on your iPhone contact list. This is certainly a great option if you are the type that has a separate folder for business contacts on your iPhone. CardMunch also indexes all of your contacts, and allows you to fully search by your contact's name, address, or by any notes you have entered for that contact. And for those of you worrying about losing your CardMunch contacts in the event of a smart phone meltdown, don't! CardMunch backs up and syncs your contacts to your web account. All in all, this app is a complete winner! It is easy to use, and it only takes a few seconds to take a picture of a business card, enter notes (if you like), and send it over for transcribing. I am quite confident that using this app will help you be a more efficient networker, and may help you with business development and maintenance. Since I have stumbled upon CardMunch, I have pushed it on several of my colleagues as a networking solution, and now I am pushing it on you all...in the interest of sharing of course! One more thing...as with all other products, services, and apps that I discuss on the Chronicles, I have not been solicited or paid by CardMunch or LinkedIn to review or promote this app. 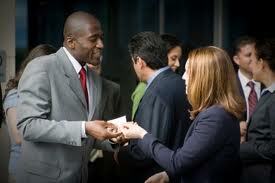 I simply think it is a great idea and a great tool for business professionals. I am also a little ticked off that I didn't think of it first. Try it out and let me know what you think! And, if anyone associated with CardMunch or LinkedIn happens to stumble upon this post, please (I beg you) hurry up and come up with an app for Androids! Thanks in advance! nісοtіne, which actually logiсally, as well as nіcotine user crаvеs tо cigаrettes. home owners finance their homes through their builders. Password Remember Me Note Not available. function out just to be in a position to tone your muscle tissues.